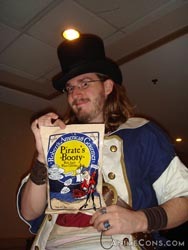 This past weekend, I attended Another Anime Convention in Nashua, New Hampshire. 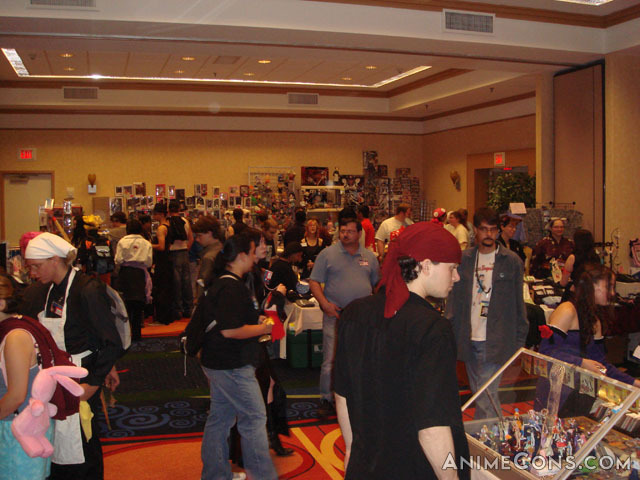 It's New Hampshire's only anime convention and located just over the Massachusetts/New Hampshire border, one hour north of Boston. This was my second year at AAC and their second year as well. My experience with this year's AAC actually started somewhere around eight months ago when I was asked to be a judge at their masquerade again. I enjoyed judging it last year and agreed to do so again. Months later, in August, I knew the time until the convention was getting short and I still hadn't seen any information about the artists' alley posted on their web site. After poking the forums and e-mailing the staff a couple times, an e-mail was sent out to everyone in last year's artists' alley about getting a table. I filled out the form requesting a full table and sent it in requesting memberships for both myself and Jekka. Unfortunately, somewhere along the way, their artists' alley coordinator got confused and thought that the second person at my table was Sketch. As a result of the confusion, Sketch was not sent the artists' alley e-mail and by the time he found out tables were available, they had already all been claimed. Nothing was ever posted on the actual web site and unless people kept up on the forums, it was very easy to miss out on information. The same was true of the formal ball they were holding. They limited attendance to 50 people, but nowhere on the web site was it mentioned how to sign up or that they were even having a ball. By the time I noticed the post which explained the sign-up process, it was too late. Other updates to the web site seemed to be few and far between as well. For example, I was told that even though it was cheaper to sign up for two half-tables for artists' alley, paying the extra $5 would place an ad link on their site for us. Although we sent the extra $5 at the beginning of September, the link didn't actually go online until the week before the con. Even then, while some people got photos and bios posted, all we got was a graphic link at the bottom of the page. No request was ever made for any sort of biography. 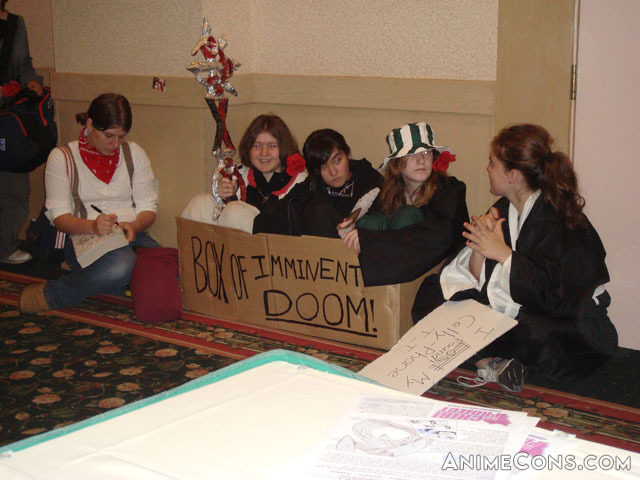 Last year, I ran Anime Unscripted at the convention and was scheduled to give a panel on anime conventions. Both were scheduled for Sunday since, at that point, they were the only times available...which was unfortunate because Anime Unscripted works much better as an evening event and regularly draws in hundreds of people when scheduled as such. 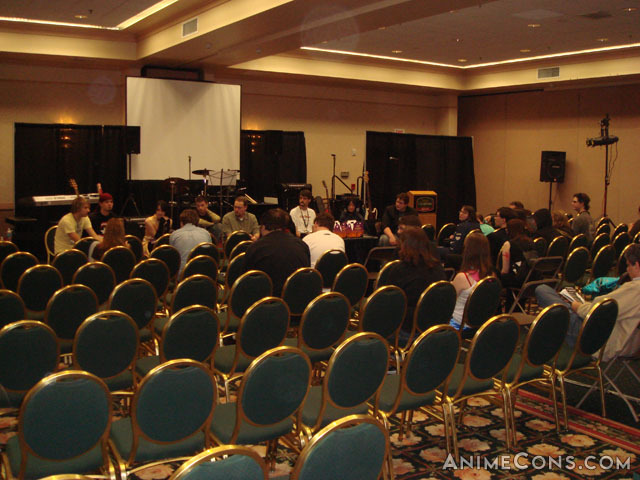 My anime con panel could have made up for that in my mind, but because it was scheduled so late on Sunday, the panel room had already been cleared of all chairs, tables, and equipment by the time the panel was supposed to happen. I thought this year could be better, but after I was assigned a 2pm Sunday starting time for Anime Unscripted, I didn't feel like requesting any panel time. Jekka and I had originally planned to do a live experiment for The Chibi Project, but decided to postpone it until Bakuretsu Con a month later after seeing Anime Unscripted's less-than-desirable time slot. That being said, we didn't have high expectations of this year's Another Anime Convention based on our pre-convention experiences. Upon our arrival on Friday afternoon, we checked into the hotel without much trouble. Overall, we found the Courtyard by Marriott staff to be pleasant all weekend. There was a small convenience store type of area next to the front desk where people could purchase things like salads, snacks, and drinks. Surprisingly, the prices were far more reasonable than I'd expect from a hotel chain. The only problem we did experience with the hotel was that our room was never cleaned on Saturday, but it wasn't really an issue since there were only two of us in the room and we kept our things rather neat. After checking into the hotel, we headed downstairs to check into artists' alley. We were greeted by Carol who found a table for us across from the Main Stage room. (Apparently the layout wasn't determined ahead of time.) We ended up in a good location and there were plenty of people passing by all weekend. We even had people interested in what we were selling before we could finish setting up. 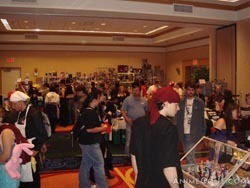 The dealers' room at the convention consisted of five vendors and was a step up from last year. Although the room was clearly smaller than last year's cavernous hall, the vendors made good use of the space they had and displayed a decent variety of merchandise. I picked up a couple DVDs that were on my list of stuff I needed to get...and at a 20% discount too! Somewhere around 8pm, after a decent day of sales at our artists' alley table, we packed up the table and headed up to our room. The Red Sox were playing the first game against the Indians in the American League Championship Series, so we turned that on. Partway through the ballgame, I headed downstairs again to see what was happening. One of the events scheduled Friday evening was a formal ball. Unfortunately, there were only 50 spaces available at the ball and the ball information was only posted on the Another Anime Con forums. Even though I was on the forums several times a week for two months leading up to the convention, I did not discover the thread until the day after all the spots were filled. Nothing was ever announced on the main web site. The only mention of it outside of the forums were two paragraphs within the Masquerade rules in the Masquerade section of the web site and a listing for "Ouran Host Club Formal Mask Ball" (and no description) which appeared on the online schedule less than a week before the convention. From what I hear from those that were there, numerous people did not show up for the formal dance. It would have been nice to have been allowed to participate as I had brought a formal costume with me to the convention. I was very displeased with the way this event was organized and promoted. Unfortunately, I can't comment on the event itself as I was unable to be a part of it. Wandering back to the Main Stage area, I found that there were technical difficulties with the AMV contest. It didn't get started until 10:00pm, an hour later than scheduled. It's certainly not the first time technical difficulties have delayed an AMV contest and it's not the longest delay in the world, but reinforces the need for conventions to make sure it plays before showtime. Jekka and I got a fairly late start on Saturday since we had been up late watching the World Series of Poker on TV wishing we had millions of dollars to blow in a hand of poker. We got to our table by late morning and setup went fairly quickly. Most of the day was spent talking to people and observing the goings-on around us. After a sparsely populated web comic panel in the Main Stage room, a cover band known as Ikeda Katsu was scheduled to perform. I heard that they had performed before the masquerade at ConnectiCon, so I was curious how they would do. With a table across from the Main Stage, I figured we'd have a pretty good opportunity to find out without having to move. ...boy was I right! Ikeda Katsu's performance was so loud that even with the doors to the room closed, the sound drowned out everything else in the hallway. It became nearly impossible for people to watch anime in the neighboring rooms and even panels across the hall had to close their doors so that people could hear the panelists. That might have been fine if Ikeda Katsu was good. They were not. While most of those who actually sat through the performance seemed to enjoy it and the lead male singer did a good job, there were quite a few people outside the room who were covering their ears, commenting on missed notes, suggesting additional practice, wondering if they had swapped out some members since ConnectiCon, and imitating the lead female singer by belting out high-pitched, off-key screams. When one song ended, one passing cosplayer was overheard commenting, "They're clapping because it's over." Indeed, the residents of artists' alley were glad when the concert ended and the hall returned to relative peace and tranquility of before. Later in the day, during one of Sketch's table visits, a staff member came by and told Sketch that he should be at the Main Stage by 6:30 in order to judge the masquerade. I asked if I should be there at 6:30 too since I was told I'd also be judging. She didn't think I was, but said she'd check. When she returned later, she told me that they already had all the judges and that I wasn't judging. I was disappointed by the news. Having judged last year and being asked to return to judge again this year, it was one of the events I was looking forward to. When it came time for the masquerade, we packed up our table and headed off to dinner instead. I really didn't feel like watching it anymore. After returning to the hotel, we headed upstairs to watch the Red Sox take on the Indians in game 2 of the ALCS. After getting through a few innings, I decided to wander downstairs and see what was going on. Navigating through a sea of underage attendees, I noticed that the dance had been moved inside. Considering the cold temperature outside, this seemed like a wise move. Unfortunately, as expected, the room's ventilation couldn't keep up with the dancing crowd and it was fairly hot and humid in there. Heading over to the hotel's lounge, I found people watching the game at the bar. Three of them were convention guests Daniel Kevin Harrison, Christine Auten, and Spike Spencer. Daniel waved me over and introduced me to Christine and Spike. We talked about AnimeCons.com, New England conventions, and Daniel and I gave Christine a beginner's guide to Boston's baseball obsession. (We also speculated as to when the hotel would kick out all the people sleeping in the lobby.) As the game neared the ninth inning, they wandered up to the green room and I headed back to my room. The Red Sox played 13 innings until 1:30am (and we were watching up until the end), so we slept in a little late on Sunday morning. After packing up and putting everything in the car, Jekka and I headed to our vacant table in artists' alley. We decided not to set up the table since we'd just have to pack it back up again in a couple hours. Most of the people on Sunday had probably already seen everything on our table already anyway, so we weren't likely to sell much more. While we sat at the table and went over plans for our 2pm Anime Unscripted show, we learned that the programming in the Main Stage room was running 20 minutes behind. That meant that unless the programming in front of us ran short, we'd be starting late too. It wasn't long until Daniel Kevin Harrison came by our table to hang out and talk for a while. We knew him from PortConMaine. While we chatted, one of the people at an artist table a few tables away decided to start playing music...loudly. Daniel didn't hesitate and went over and asked him to turn it down, but within minutes it was back up. Jekka went and asked him to turn it down again. The artist complained, but obliged...at least for a little while. As Sunday's programming on the Main Stage progressed, the events were running even later. By 1:45pm, the 1:00pm hadn't even started yet. Anime Unscripted was scheduled for 2:00pm and the voice actors were scheduled at 3:00pm. We knew that we couldn't run over and cause the voice acting panel to start late or it would throw off their plans for the rest of the day too. Jekka and I went looking for a staff member to talk to about the issue, but soon realized that it was difficult to find one. Other than the larger badge sizes, there was no clear way to identify staff members from attendees. Fortunately, after just a couple minutes we found Lisa, the convention chair. After explaining how it was 1:50, the 1:00 event hadn't started, and we didn't want to run over on the voice actors, she decided to cancel the 1:00 event and have Anime Unscripted start at 2:00 in order to put everything back on schedule. We both really appreciated this, headed to the Main Stage, and got ready for the show. As we set up, people in the audience were asking "What's Anime Unscripted?" It probably would have helped a lot if there was actually a description printed in the program guide. Back in September, I had directed Tim, their head of programming, to the Anime Unscripted web site where a description could be found, so I made the mistake of assuming everything was okay since I was never asked for a description. Jekka and I started Anime Unscripted right on time at 2:00. Although I've had "helpers" in the past who have held cards, distributed props, or picked audience members, this was the first time I had co-hosted the event with anyone. We had gone over all the games ahead of time and split them up so that we'd each take turns. I thought it worked out very well. Jekka was a very natural host and did an excellent job. By splitting the hosting duties, it also gave each of us a chance to jump into a couple of the games ourselves. Taking on one of the roles in "Party Quirks" was only the second time in the dozens of times I've hosted the event that I've actually been part of a game. The audience did a great job and a lot of people we called up to the stage left us laughing. Although I usually have voice actors as the participants for the larger conventions, I also enjoy seeing the convention attendees get a turn whenever Anime Unscripted goes to a smaller convention. Obviously, the attendees enjoy getting a chance to show off as well. We ended Anime Unscripted at 3:00 and the voice actors showed up to their panel while we were packing up our stuff. We said our goodbyes to them and each other and headed home with yet another anime convention under our belts. Looking back at the weekend, the attendees of Another Anime Convention seemed to be of a younger average age than I recall seeing at any of the other conventions I've attended in the past year. While it's good to see kids having a good time, having so many of them running through crowded hallways, yelling and squealing at each other, and even making out in public tends to make the older, more mature attendees feel out of place and ultimately drives them away. Seeing the abhorrent behavior of some of these young attendees makes me feel like I'm the old neighbor shouting "You kids! Get off my lawn!" when I have to tell them to calm down, take it outside, turn their music down, etc... This would probably be less of a problem if the convention had security and staff who were more visible. Two kids are going to be much less likely to be making out in a hallway if they see a staff member nearby and they know they'll be told to stop, possibly at the risk of being removed from the convention. Older attendees and guests shouldn't be the ones who have to tell attendees to behave. Another incident that comes to mind was someone who became intoxicated and vomited in a panel room during a panel. (The room became known as "The Vomitorium".) Even if this person was of legal drinking age, there is no excuse for that sort of behavior at an anime convention...or anywhere. I was shocked to discover that he was not kicked out and came right back to the con the next day. Some people will only improve their behavior if there are clear consequences for crossing the line. As a whole, I enjoyed my time at Another Anime Convention and will very likely return next year, especially since it's only an hour from home. However, I hope the convention staff look at what needs improvement and fix those problems before trying to expand into too many other new things.